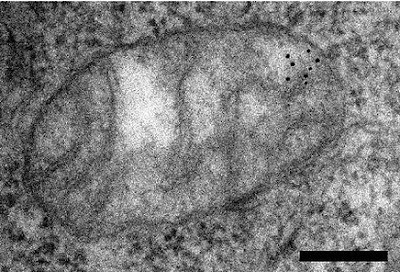 An electron microscope picture of a mitochondrion, the key to all our genetic ancestry! Well, the latest round of DNA results are in! These are mtDNA results (mitochondrial DNA -- mitochondria are tiny organelles that live within every cell in our bodies and create energy), and they tell us about our direct maternal line; that is, everyone descended from Grandma Walli Ortman. It represents her genetic linage, through Grandma Sophie, her mother Wilhelmina Schulze, her mother ?, and on and on back. It goes only through the maternal line, so the Hugs that I've been writing about, for example, are not at all included in this, because they are in Grandpa Bill Ortman's line. But anyone descended from Grandma Walli Ortman is part of this lineage. Stick with me, here, because this gets a little complicated, and I've been looking into it all day and feel like my head is about to explode. I studied genetics and really enjoyed it, but that was 30+ years ago! So it's hard to understand all the fancy stuff. I might wind up breaking this up into a couple of parts. So. A long, very long, time ago, maybe 200,000 years ago, a woman named Mitochondrial Eve lived in East Africa. She's probably not the "real" Eve we read about in the Bible, more likely one of her descendants that geneticists can identify as having left a DNA trail in the genes of most (? all?) people alive today. Look in the lower right of Africa, where it says "L0." That's Mitochondrial Eve, our ancestor from 200,000 years ago. Mitochondrial Eve was surely not the only woman alive at that time, but she's the one who passed her DNA down to most everyone alive today. Our path goes from L0 through L1 to L3 -- see it in the upper right? This is a woman who was the descendant of Mitochondrial Eve. The lineage of L3 between 73,000 and 57,000 years ago split into two different lineages, M and N. We can refer to their genetic pattern as "macro-haplogroups," in that their genetic patterns were passed on to many, many humans that are alive today. Okay, at this point, we're following the N-line, and it leads out of Africa, through the Arabian Peninsula, now Saudi Arabia. So look back to where we entered Saudi Arabia in the last map. At this point, 61,000-45.000 years BP (BP = before the present time), it seems like the huge N-group splits up, and one of the groups it splits into is R, which you can see in the middle of the map, a little to the left. 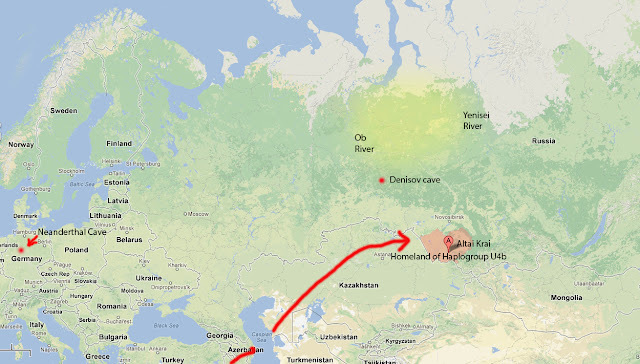 Evidently some women with mtDNA N left the Caucasus following deer herds towards areas near the Black Sea. The R-group gave birth to a number of other groups -- can you see where it says "U1,2e,3,4,5,7, 8"? That's us!! We are U4, and we've come into being somewhere in the fertile Middle East. I'm feeling like I should stop for today pretty soon, because maybe it's a lot to absorb. But I'll go on a little bit more. So when the R population split up, our group, the U4's, headed north to Altai Krai, a part of the current Russia that is on the Western steppes of the Ural Mountains. 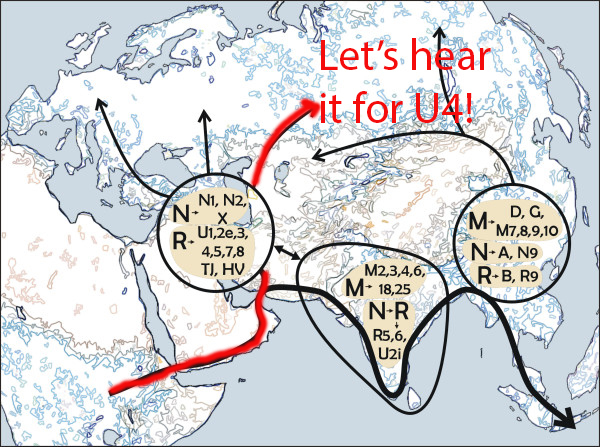 Another U4 group, I think, went to India, and my mtDNA results showed 17% Southern Asian, maybe India? And then to Altai Krai? 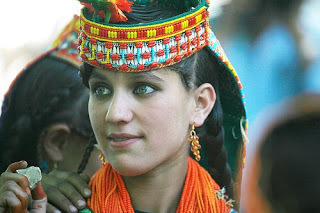 One group of today that has a lot of U4 DNA is the Kalash people of Pakistan. Obviously Caucasian rather than Asian (note the blue eyes), they trace their lineage back to the Middle East, where the R/U branches split off. You are the first person with mt paternal grandmothers exact haplogroup that I found! Quite by accident too. My results are from Genographic Project and 23andme. I have always wondered where my darker looks came from, my maternal family are blonde, blue-eyed. My father and look different than anyone in either family. I hope you wrote more, we are family! Please contact me through the email on my profile. I'd love to compare notes! We're in Siberia . . . brrrrr!